The pattern of muscle glycogen synthesis following glycogen-depleting exercise occurs in two phases. Initially, there is a period of rapid synthesis of muscle glycogen that does not require the presence of insulin and lasts about 30–60 minutes. This rapid phase of muscle glycogen synthesis is characterised by an exercise-induced translocation of glucose transporter carrier protein-4 to the cell surface, leading to an increased permeability of the muscle membrane to glucose. Following this rapid phase of glycogen synthesis, muscle glycogen synthesis occurs at a much slower rate and this phase can last for several hours. Both muscle contraction and insulin have been shown to increase the activity of glycogen synthase, the rate-limiting enzyme in glycogen synthesis. Furthermore, it has been shown that muscle glycogen concentration is a potent regulator of glycogen synthase. 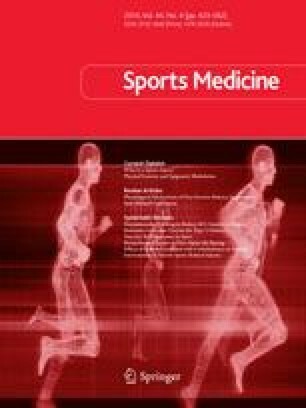 Low muscle glycogen concentrations following exercise are associated with an increased rate of glucose transport and an increased capacity to convert glucose into glycogen. The highest muscle glycogen synthesis rates have been reported when large amounts of carbohydrate (1.0–1.85 g/kg/h) are consumed immediately post-exercise and at 15.60 minute intervals thereafter, for up to 5 hours post-exercise. When carbohydrate ingestion is delayed by several hours, this may lead to ∼50% lower rates of muscle glycogen synthesis. The addition of certain amino acids and/ or proteins to a carbohydrate supplement can increase muscle glycogen synthesis rates, most probably because of an enhanced insulin response. However, when carbohydrate intake is high (≥1.2 g/kg/h) and provided at regular intervals, a further increase in insulin concentrations by additional supplementation of protein and/or amino acids does not further increase the rate of muscle glycogen synthesis. Thus, when carbohydrate intake is insufficient (<1.2 g/kg/h), the addition of certain amino acids and/or proteins may be beneficial for muscle glycogen synthesis. Furthermore, ingestion of insulinotropic protein and/or amino acid mixtures might stimulate post-exercise net muscle protein anabolism. Suggestions have been made that carbohydrate availability is the main limiting factor for glycogen synthesis. A large part of the ingested glucose that enters the bloodstream appears to be extracted by tissues other than the exercise muscle (i.e. liver, other muscle groups or fat tissue) and may therefore limit the amount of glucose available to maximise muscle glycogen synthesis rates. Furthermore, intestinal glucose absorption may also be a rate-limiting factor for muscle glycogen synthesis when large quantities (>1 g/min) of glucose are ingested following exercise. This work was supported by a grant from SmithKline Beecham Consumer Healthcare (UK).